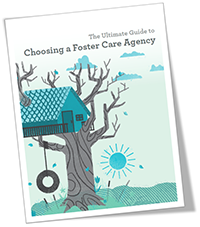 You know that selecting the right foster care agency is important, but do you know what to look for? This free eBook is the ultimate resource for finding the best agency to support you in your foster parenting journey. Learn the top qualities you should look for in agencies that support foster parents and the questions that will guide you to clear answers. Discover how to evaluate a foster care agency's training, support, reputation and quality. Get a handy checklist to assist you when you begin reaching out to agencies. Get your free copy by filling out the form and start learning how to choose the right agency!